This is a usual query today, as people are more conscious about their appearance today; and teeth are one of the important factors affecting that appearance. When you meet someone first, the first thing you may notice will be their smile at you. And that smile has an impact on judging his / her confidence and character. Everyone likes to be beautiful and get impressed. A beautiful smile can do wonders in creating an impression on other people’s mind. Let’s look at tips to whiten teeth. When you want to make an impression on the first meeting, you should be careful about your smile first. Any discolored teeth, crooked, aged, or chipped teeth etc. should be corrected and masked. Because these things can give a negative impression on you signaling that you are a person who doesn’t care yourself. When a person can’t care himself, how can he care other things? This may be the question that is going on other person’s mind. How to whiten teeth and get a beautiful sparkling smile? While you are concerned about your smile and teeth appearance, it is also important to protect your teeth and gums against cavities and diseases like gingivitis. When you try to keep your teeth beautiful it will also help the teeth to be healthy. This is a question that is asking many people. When you have this question, keep in mind; while whitening your teeth, the health of your teeth is also important. Some of the teeth whitening methods may give you the best sparkling teeth but may damage your teeth. So when you choose a method, be sure to check it’s side effects or after effects too. Below is going to describe some common home tips to whiten teeth that will help to naturally whiten your teeth. Home remedies are usually natural and harmless. That helps us to keep the oral hygiene too. Brushing and flossing after drinking or eating is the best way to whiten your teeth naturally. But when you are not at home this can’t be possible always. Yet remember this as the first point to whiten your teeth naturally. Try to avoid smoking cigarettes and drinking coffee, tea, soda etc. that cause stain on your teeth. If you want to drink staining beverages, drink it using a straw. Drink plenty of plain water after you eat or drink anything, especially after any acidic or staining food. Eat a healthy diet that can also prevent teeth yellowing. Use a good toothpaste that is not too abrasive. The abrasive particles in toothpaste can scratch the porcelain restorations and even natural enamel. Hence be careful about selecting the right toothpaste that is suitable for your teeth. Toothbrushes are available in two types- Soft/ hard. You can choose the type you prefer. Yet, it is better to select a soft toothbrush that won’t damage your teeth. Use Hydrogen peroxide as a total mouth and gum cleaner to keep the mouth germ free. It is an antibacterial agent which can be used to rinse your mouth. Use equal parts of hydrogen peroxide and water, swish around your teeth for about one minute and then rinse. Another way to use it, mix with small amount of baking soda to make a paste and use it on teeth for about 30 seconds to remove plaque and rinse well. These methods whiten your teeth and provide natural protection against gum diseases. Add a few drops of coconut oil on toothbrush and brush with it, Or use a clean cloth and add few drops of coconut oil into it and then rub on teeth. These methods can whiten your teeth naturally without any side effects. Another method of using coconut oil is ‘oil pulling’ method. For this take a spoonful of coconut oil into your mouth, swish around mouth and between teeth for about 20 minutes and then rinse off. Coconut oil is a preventive therapy for oral hygiene. Its antimicrobial properties will protect your teeth and gums effectively. Apple Cider Vinegar is naturally acidic, which helps to break down plaque or other substances that are stuck in the teeth. Since the pH level of apple cider vinegar can remove the stains on your teeth, it can be used to whiten your teeth. It contains compounds, such as acetic acid, magnesium, potassium, probiotics, and enzymes, which will kill germs and foster the growth of beneficial probiotic bacteria. To get the result, use it at least a month continuously. Be careful, not to remove the enamel on your teeth with its acidic property when used carelessly. After brushing with Apple Cider Vinegar, brush again with regular non-fluoride paste and then rinse out well. Peels of citrus fruits like lemon and orange, lemon essential oil, etc. containing beneficial acids can also use to whitening teeth. But if used aggressively, the high acid content can eventually wear away the enamel on teeth. Always rinse your mouth after you use lemon or orange peel on your teeth. For best results, use the hydrogen peroxide oral rinse formula. Some foods that can help keep your gums and teeth strong, and free from diseases or signs of aging. Berries (strawberry, raspberry) which contains antioxidants, yogurt or raw milk contains calcium, leafy green veggies, apples and pears with potassium and magnesium, eggs, mushrooms, carrots, celery, nuts etc can benefit the health of your teeth as well as keep your body healthy. A quality diet is tied to the health of your teeth. Simple use of berries like fruits rubbed on your teeth can whiten your teeth naturally. Charcoal is an absorbing product used to trap toxins inside the body. This can also use to whiten your teeth. Wet the toothbrush and then dip into activated charcoal powder. Brush your teeth especially concentrating on the areas where stains are present. Sip some water to swish through the mouth and then spit. Rinse well. This home remedy can whiten your teeth well. If you have used dental treatments like crowns, caps, or porcelain veneers, this home remedy is not suitable. 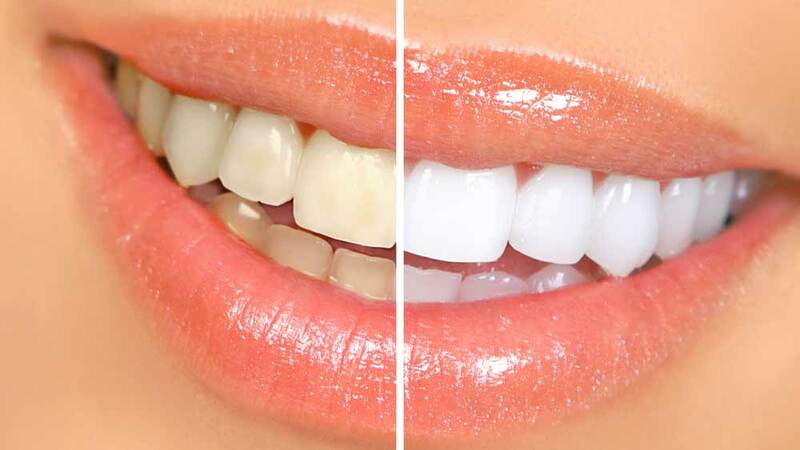 If you find this post “Tips to whiten teeth” useful one share this post with your friends. If you want to clear any queries related to teeth disease or need to take an appointment in a dental clinic, feel free to contact Cosmetic dentistry division at All Smiles Dental Spa, Dubai.